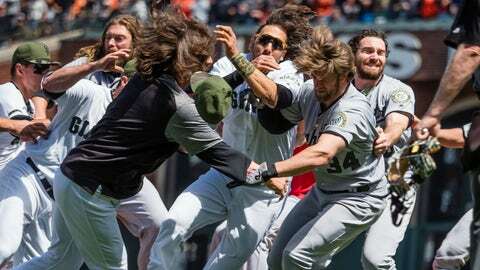 As the Giants and Nationals await the discipline for Monday’s brawl, agent Scott Boras contends that his client, Nationals right fielder Bryce Harper, deserves a lesser penalty than some other players receive when they charge the mound. 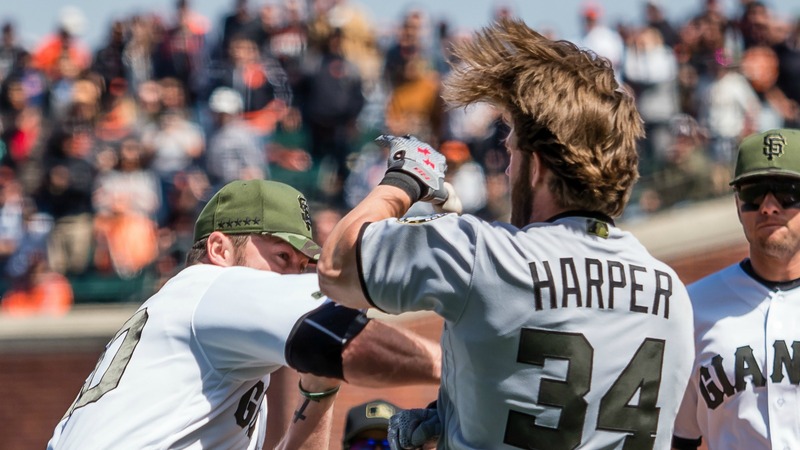 Boras told FOX Sports on Tuesday that because there had been no “notice of provocation” between the Giants and Nationals, Harper should not be treated as harshly as a player who expects to be hit with a pitch and then tries to fight the pitcher. 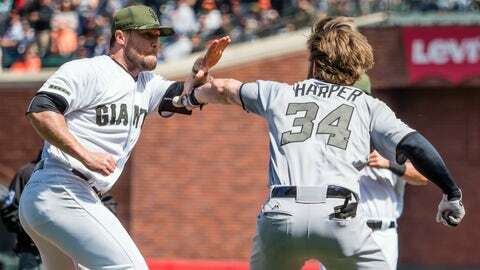 Harper charged the mound Monday after Giants reliever Hunter Strickland drilled him in the hip, seemingly in retaliation for the two home runs that Harper hit off Strickland in the 2014 Division Series between the clubs. “In this situation, there is nothing prior between the clubs, no notice to the player, just a paroxysm of rage, self-centered behavior that was out of bounds,” Boras said, referring to Strickland. “This wasn’t about a player’s team. It was about a self-centered act. “Major League Baseball cannot allow this to be a County Fair duck shoot — ‘Here, I’m going to do something for myself.’ Because of that immediate sense of fear a player has when someone throws the ball 100 mph at him, his response is not any way like it normally is when you have a notice of provocation. As an example, Boras cited an incident last June between the Royals’ late Yordano Ventura and Manny Machado. The two had a verbal exchange after Ventura twice threw inside on Machado in the second inning. Machado charged the mound after getting hit in the fifth, threw a punch at Ventura and slammed him to the ground. Baseball suspended Machado for four games. Boras said that Harper should get a lesser penalty because he could not have sensed that he would get hit on an 0-0 count with two outs in a game that the Nationals led in the eighth inning, 2-0. Machado, on the other hand, had the earlier confrontation with Ventura. Joe Torre, MLB’s chief baseball officer, might see it differently. Jayson Stark, formerly of ESPN, noted on Twitter that Torre at times has suspended hitters eight games for charging the mound, and relievers three to six games for plunking hitters. The Padres’ Carlos Quentin received eight games in 2013 after he charged the Dodgers’ Zack Greinke and broke his collarbone. Harper also flung his helmet as he charged the mound, though his toss was errant and landed nowhere near Strickland.